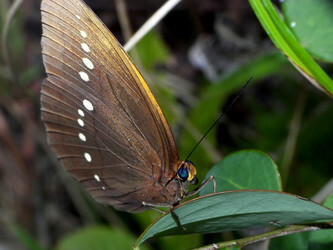 An Indo-Australasian clade of large forest floor-dwelling butterflies. Amathusiini were formerly considered a tribe of "Morphinae," but they are no more closely-related to the neotropical morphines than either is to various other groups of Satyrinae. Corbet et al. (1992) state that Faunis, Melanocyma and Taenaris "form a natural group probably worthy of subtribal rank ... ." This hypothesis is supported by preliminary molecular results (Peña et al. 2006, Wahlberg & Brower unpubl.). Hyantis and Morphopsis, two New Guinean genera traditionally included in Amathusiini, appear to be associated instead with Elymniiini. 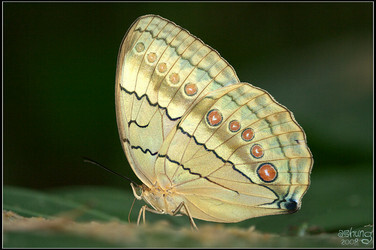 Note that Xanthataenia is not an amathusiine. This was pointed out by Corbet et al. (1992) on the basis of larval morphology, and has been corroborated by molecular evidence (Wahlberg & Brower, unpubl.). Page: Tree of Life Amathusiini Moore 1894. Authored by Niklas Wahlberg and Andrew V. Z. Brower. The TEXT of this page is licensed under the Creative Commons Attribution License - Version 3.0. Note that images and other media featured on this page are each governed by their own license, and they may or may not be available for reuse. Click on an image or a media link to access the media data window, which provides the relevant licensing information. For the general terms and conditions of ToL material reuse and redistribution, please see the Tree of Life Copyright Policies.